In April 2015 South Africa was rocked by yet another wave of Xenophobic violence. Many people tragically lost their lives and were driven from their homes. The Ramazani family fled the DRC because of conflict and came to South Africa with hopes of finding political refuge and a better future. The family faced hardships daily and barely managed to make a living here. Since the attacks, they do not feel safe or welcome in South Africa. Zaina, the youngest of the Ramazani family, had witnessed the uproar of the attacks, such as people burning down houses. Traumatised, Zaina and her family found refuge in the Save the Children South Africa Child Friendly Space. 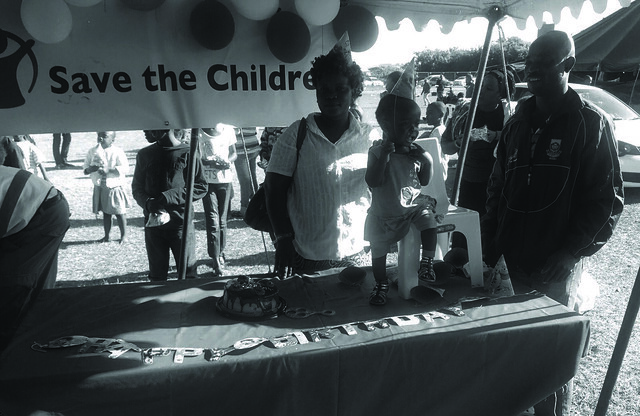 While going about her duties to register children, Prelisha, one of our dedicated Save the Children South Africa staffers noticed that Zaina was born in May 2014 and was about to celebrate her first birthday. Prelisha was inspired to throw Zaina her first birthday party, bringing some joy to over 50 children who received par ty packs. The children were all very thankful and full of smiles. For children like Zaina the Child Friendly Space offered a sanctuary. Molefi, Zainia’s father, thanked Save the Children South Africa for their efforts, saying that before coming to the camp Zaina was afraid, hungry and crying, but now she is happy. You can support children like Zaina's by becoming a committed monthly donor today.